In my recent report on the SME Annual Meeting in Minneapolis, I bemoaned the fact that mineral processors were rather thin on the ground this year. The SME Meeting tends to attract people in our field when there is a mineral processing symposium in someone's honour. 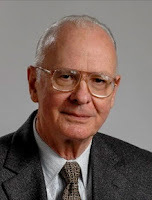 Next year we might expect a record turnout, as there is a very special symposium planned, in honour of one of the legends of minerals processing, Prof. Douglas Fuerstenau, who will be 90 years of age this coming December (see also posting of 20 July 2015). The Mineral Processing Division of SME, in collaboration with the International Mineral Processing Council, will host this International Symposium, Reflections, Challenges and Opportunities in Minerals Processing, at the 2019 SME Annual Meeting to be held on February 24-27, 2019, in Denver, Colorado, USA (full details on MEI Online). Deadline for abstract submission is August 15, 2018. "Mineral processing in the digital era; innovations at the interface of IT/minerals engineering technology and education"; and am trying to identify whether to aim to speak at that session.